Capture an unforgettable snapshot of Vietnam’s shoreline with our tour of the Central Coast. Cycle iconic sandy-white beaches framed by coconut palms, with the sails of junks and sampans floating on the emerald green horizon of the South China Sea. The narrowest section of this unconditionally friendly country holds an incredible number of sights to feast your eyes on, making the ride worth all the effort involved. Tackle the twists and turns of the Hai Van Pass and reward yourself with a view of the Marble Mountains, a haunting spot created by a cluster of 5 elemental rocks. 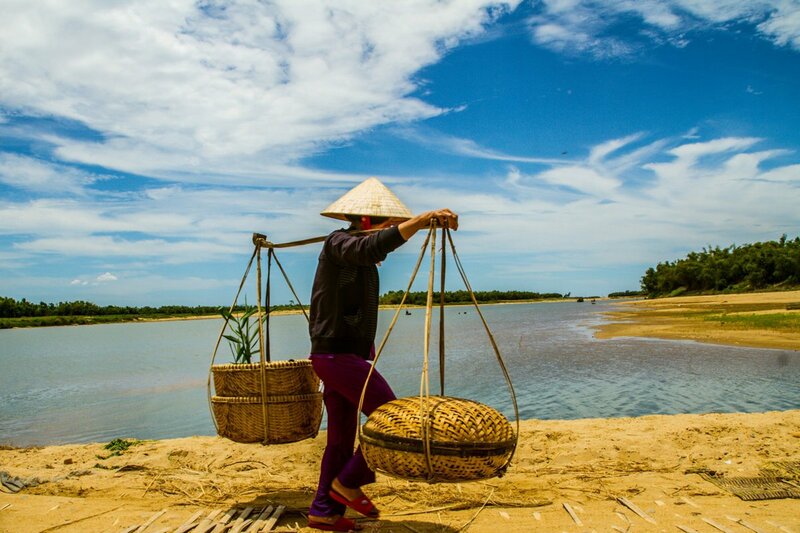 Bike past the paddy fields of Hoi An to encounter scenes of Vietnamese rural life. Planting and harvesting techniques passed down through generations that are nearly as old as the Truong Son peaks of the area flowing down into the sea. Remote, scenic backroads snake us through tribal and Viet villages before throwing us out onto the Hon Gom peninsular road. Here, the dazzling shore is broken up by wild sand dunes and beautiful rocky promontories jutting out into the water. And get away from it all to unwind and enjoy the seclusion of Whale Island for a well-deserved rest at journey’s end. Meet in Hue, the old capital of the Ngu Yen Dynasty. From Hue, we follow the coast as we ride on roads shaded by coconut palms and dunes scattered with mini mausoleums, pagodas, and war memorials. Overnight at resort on Lang Co Beach. Climb Hai Van Pass for superb views of the bay and ride downhill to Danang for lunch. Cycle to China Beach and then on country roads to UNESCO World Heritage Site, Hoi An. From Hoi An, we ride on country backroads past paddy fields to visit My Son, the ancient centre of the Cham civilisation, returning to Hoi An early in the afternoon. We transfer from Hoi An to Quang Ngai where we ride to My Lai, the site of one of the worst massacres of the American War, and then through the Vietnamese countryside. We journey to Qui Nhon and cycle a loop to Ba To Town, riding on quiet backroads where people are unaccustomed to the sight of western cyclists. Ride from Dieu Tri along a remote but well surfaced road. The terrain is gently rolling, with beautiful views of the highland foothills. Transfer to avoid the highway to our hotel in Tuy Hoa. On our last cycle, we soon have mountains on both sides as we ride through a network of lush rice fields in the valley. We ride to the Hon Gom Peninsula and take a boat to Whale Island. Today is free to relax on the beach, snorkel, or scuba dive. We transfer back to the mainland and then onto Nha Trang for onward connections. Day 2 - Hue - Lang Co Ride 65km. +190m / -194m. I am so happy I went on this trip. Wasn't sure what to expect but it was wonderful. Everyone from guides to fellow riders couldn't have been better. I got to see this beautiful country and enjoy their food. Thanks to our guides, it was a trip I won't forget. Outstanding trip! The best thing about SpiceRoads is the guides! While the countryside is always beautiful, and the cycling fun - it's the guides that truly make the trips amazing. Our guide in Vietnam, Mr. Lee was so knowledgeable, friendly and committed to our safety and pleasure. We felt so well looked after! I loved everything about this tour! This was my first time taking a bicycle tour and I didn't really know what to expect, but I can't imagine a better experience. I have traveled to Vietnam several times in recent years, but only to the major cities. This tour gave me a great opportunity to see the villages, countryside, and back roads of this fascinating country. The service provided by our SpiceRoads team was outstanding. After every stop, our water bottles were refilled, we never had to check into a hotel or carry our luggage as that was all handled, and every little detail was handled smoothly. The highlight of trip was definitely our outstanding guides Lee and Anh! Their true professionalism, their fascinating insights and information about the country and their friendly sense of humor were all delightful. Our biking adventure takes us from Hue to Nha Trang by bus, boat, and bike. Lots of time on this tour is spent sight-seeing and exploring Vietnam. The cycling is on a mixture of well-surfaced roads and good quality, wide dirt tracks. Away from the main roads, cycling in Vietnam is often a wonderful experience; the bicycle is still the most common form of transport, and you will share the road with girls in flowing ao dais, school children, and farmers. The rest days are at the end of this tour where we have time to relax at Whale Island before heading to Nha Trang for onward connections. By the end of the tour, we hope you will really feel you have come to know and perhaps even understand Vietnam and the Vietnamese. Suitability: This trip is suitable for anyone with a reasonable level of fitness. This trip is not too arduous, and so riders with less experience are more than welcome, although the fitter you are, the more you will enjoy it. Biking Conditions: This trip is mainly on good quality tarmac roads and some vehicle-width dirt roads. Day 4 has an off-road trail (can be rocky), but an easier alternative is available if required. An air-conditioned support bus travels behind the group. On the occasions when it is impossible for the bus to follow, our guide follows behind on a motorcycle. Participants can cycle as much or as little as they like and still enjoy the same views as the rest of the group. We start this tour by meeting in Hue (you can fly to Hue from Saigon or Hanoi – SpiceRoads can arrange these internal flights). Hue is the old capital of the Ngu Yen Dynasty. It is worth arriving in the morning, so you have time to explore this wonderfully historic city. If you arrive in time, we offer a city tour by bike. Alternatively, you can fly into Danang and transfer up to Hue (transfer can be arranged at an additional cost). We leave Hue and follow the coast as we pass roads shaded by coconut palms, and dunes scattered with mini mausoleums, pagodas, and war memorials. We ride to Phuoc Tuong Hill and then transfer the final 40 km to Lang Co Beach. We have lunch, and the rest of the day is free to enjoy the resort and beach. Today is a tough start as we have Hai Van Pass to climb today, which is a 10-km climb and ascends 550 m. It is a gradual climb with many switchbacks, and once at the top, you get superb views, well worth the ride. The reward is a downhill to Danang, our destination for lunch. After lunch. we have a flat and very scenic ride to Hoi An. It is just a short distance to the Marble Mountains, an outcrop of five rocks said to represent the five elements, (Wood, Water, Metal, Fire, and Earth). We then visit China Beach, made famous by an American TV series of the same name. After a brief stop at the beach, we continue down this country road to Hoi An. The town was known as Faifo to early western traders and was one of Southeast Asia’s major trading ports during the 17th and 18th centuries. It was an important point of call for Chinese, Japanese, and Portuguese traders, and the architecture reflects its cosmopolitan past. More than anywhere in Vietnam, Hoi An retains the feel of the past. There are over 844 structures of historical significance, and most people spend the day wandering around and enjoying the sights and atmosphere. Staying another night in Hoi An, we ride to out on small village roads on our way to visit My Son, the ancient centre of the Cham civilisation. The ride is worth the effort and is arguably one of the best of the trip. We cycle along scenic country backroads past paddy fields, passing many pretty villages. Eventually, we arrive at My Son, which was once Champa’s greatest city. Although many of the temples were destroyed by American bombs, there is still enough of the archaeological site to impress most visitors. We take lunch before spending the afternoon visiting the site. In the afternoon, we transfer by bus back to Hoi An, or we can ride. Dinner is your choice. In the morning, we transfer from Hoi An to Quang Ngai (about 2.5 hours). After we check in, we ride to My Lai, the site of one of the worst massacres of the American War, as it is known in Vietnam. We have a small climb up to an old temple before we will visit the memorial and have a guided tour of the site and museum. We then continue cycling out into the Vietnamese countryside, passing through quiet, rural villages before eventually arriving back at Highway 1, where we transfer back to hotel. 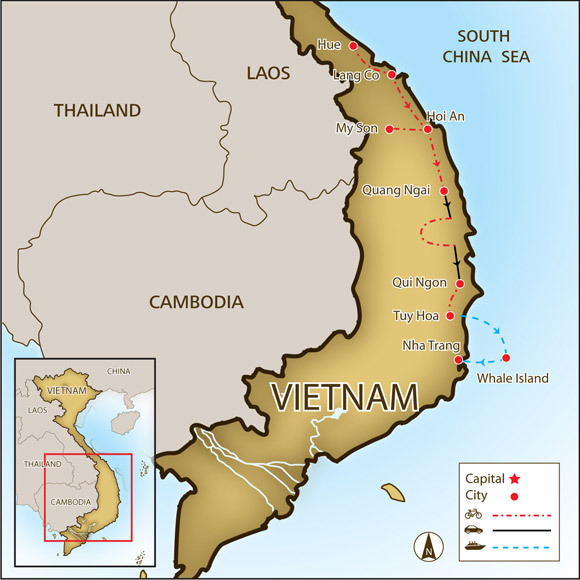 We leave early for the journey to Qui Nhon, the capital city of Binh Dinh province, an American port and supply centre during the Vietnam War and refuge for thousands of Vietnamese fleeing the vicious bombing of the countryside. We transfer 30 km out of town, past the busy and dusty section of Highway 1. We turn off the main road and cycle a loop to Ba To Town, heading southwest. The road is extremely quiet, and people are unaccustomed to the sight of western cyclists. Looping back to Highway 1 at Duc Pho, we then transfer the rest of the way in the afternoon to Qui Nhon. Upon arrival, there may be time to visit the leper hospital where visitors are welcome to make a small donation. We transfer out of town to avoid the main highway. We start riding at Dieu Tri along a remote but well surfaced road running alongside the railway. The terrain is gently rolling, with beautiful views of the highland foothills. We pass a mix of tribal and Viet villages. Ubiquitous potbellied pigs and barefoot children trot across your trail. Soon, we loop back to the main highway with a small climb and descent to finish the ride. We then transfer about one hour to Tuy Hoa, one of the most rural regions in Vietnam. Today is the last cycling day and is perhaps the most memorable. We ride from our hotel, and, after 20 km, the riding is very beautiful, with looming mountains on both sides and a network of lush rice fields across the valley. We ride 4 km up over a pass and down to the stunning Dai Lanh Beach, where we stop for refreshments and a swim for those who don’t mind getting their bike shorts wet! We continue riding for 3 km before turning off on the Hon Gom peninsular road that extends for 20 km. The scenery here is like a moonscape and unlike anything else seen on the tour. Here, we swap bikes for boats and head to Whale Island for some well-deserved R&R. The boat journey will take about 10 minutes. We stay at the secluded Whale Island resort for two nights. Today is free on Whale Island. You can take the opportunity to relax by the beach or perhaps do some snorkelling or scuba diving. We will all meet in the evening for a farewell dinner. We transfer back to the mainland and then onto Nha Trang for any onward connections. Anyone who would like to stay longer on Whale Island or in Nha Trang should contact us for hotel rates (we offer all our clients the best agent rates). Alternatively, for those who want to bike more in Vietnam, we have a four-day mountain bike trip in Dalat or a five-day trip to the Mekong Delta. Please ask for our itineraries. Because some people can't imagine going on a trip without their own beloved bicycle, we do not provide them as part of this tour. However, you can hire bikes locally for the price listed in the tour pricing section. The bikes are well-known makes of hybrid and mountain bikes with lightweight alloy frames, 24- to 27-speed gearing, v-brakes, and Shimano components and front suspension. If you bring your own bike, please make sure it is a hybrid or a mountain bike in good mechanical order. You can also hire an electric bike (or an E-Bike) for the price listed in the tour pricing section. We have 2 sizes available: S = 155 cm - 170 cm and M = 171cm - 180 cm. The E-Bikes are GIANT brand with SHIMANO Alivio1,9 speed, disc brakes, and adjustable suspension fork. Basic spares and tools are carried by the guide and on the support vehicle, though we cannot guarantee having spares for every conceivable problem. Carrying a basic tool kit, a spare tube and a pump while riding is recommended. Wearing a helmet is required on all our biking adventures and is non negotiable. If you do not wear a helmet you will not be allowed to cycle. Your tour leader is trained in first aid and emergency rescue, but to a large degree you must be responsible for your own safety while riding. It is therefore compulsory that you take out travel insurance that will cover you for a mountain biking tour. You will be led by a local English-speaking guide and if the group is 9 people or more we will add another guide to the tour. All our guides are well informed in the history, culture and religions of the area where you are biking and are skilled at passing that knowledge on to you. Your guide is also medically trained and an experienced cyclist, able to handle most minor repairs en route. Please make sure your passport is valid for a minimum of 6 months beyond the duration of stay in Vietnam. Most nationalities require a visa for Vietnam, however 22 nationalities including citizens of UK, France, Germany, Spain and Italy are exempted from visa when entering Vietnam not exceed 15 days, regardless of type of passport and immigration purpose. However they must acquire a tourist visa if staying longer. For a list of countries exempt go to this page. For 46 nationalities – including Australians, Canadians and Americans – an e-visa can be obtained. This must be applied for and received before departure to Vietnam. To check for the E-visa and tourist fee for single entry and multiple entries please check the Visa fee. You must scan a copy of your photo and passport when applying and get your approval letter of your visa on arrival at international airport of Vietnam. To learn more click Visa process. The processing time is 1-3 working days (not include Saturday,Sunday and Vietnamese holiday). Alternatively you can obtain a visa to Vietnam from the embassy worldwide. Here is the list of locations. You must specify your arrival date when applying for a visa and it is from this date that the 30 days will be calculated. When picking up your visa check to be sure the dates match your travel plans and that it is stamped directly into your passport as it will not be accepted if it is stapled in. Recommended vaccinations are typhoid, polio, tetanus and hepatitis A. A certificate for Yellow Fever is required when arriving from an infected area within six days. Vietnam is a malarial area and you will need to take anti-malarial tablets. Please speak to your doctor for the most up to date information. Weather in Vietnam is divided into 4 main regions - the far north, north, central and south. The far north can get very cold in December and January while the dry season runs from October to late March and the wet season between April to September. In Hanoi & the north, it is hot, wet and humid from May to October while November to April is cooler and dry. Central Vietnam experiences hot, dry weather between January & August with temperatures ranging in the mid 30°C. High levels of rainfall are during September - November. Southern Vietnam is dry and hot from November to April, and warm and wet between May & October, with the highest rainfall in June, July & August. Meals are included as per the itinerary where B = breakfast, L = lunch, D = dinner. Most meals are Vietnamese food and features noodles, rice curries and soups. Vietnamese cuisine is world famous and we make sure you sample as much variety as possible. Any special dietary requirements can also be catered for as well. Please let us know at the time of booking. Keeping you completely hydrated is a job we take very seriously. Cold water, some energy-restoring local fruit, and soft drinks are included in the tour price while riding. Soft drinks and other beverages during meals are not included. Beer is freely available everywhere in Vietnam but is NOT included in the price. SpiceRoads does not require you to pay a surcharge for traveling alone. We will arrange for you to share accommodation with another traveler of the same gender and if we can not match you up we will provide a single room at no extra charge. If you prefer not to share a single supplement is payable to guarantee your own room. The cost of the single supplement is listed above. We recommend that you tuck away a few extra dollars, perhaps US$10, for incidentals. It is customary to tip local tour guides and drivers, however, the amount you give should be dependent on the level of service you receive. As a general guide, we suggest US$ 3-4 per person per day is appropriate. The official national currency is the Vietnam dong (d), but the US dollar is widely accepted in tourist centers. However, in smaller towns and villages the dong is preferred. ATMs are available in all major tourist destinations and big cities. Vietcombank has the best network with a single withdrawal limit of 2,000,000d (about US$125). Most major currencies can be exchanged at leading banks in Vietnam, but the US dollar is preferred away from the tourist centers. Changing US$100 will make you an instant millionaire! You cannot legally take the dong out of Vietnam but you can reconvert reasonable amounts of it into US dollars on departure.